This topic contains 2 replies, has 2 voices, and was last updated by Andre 3 weeks, 6 days ago. Hello, I’m building out my IG32 DM robot. So far I’ve wired up the motors to the Roboclaw 2×7 controllers. 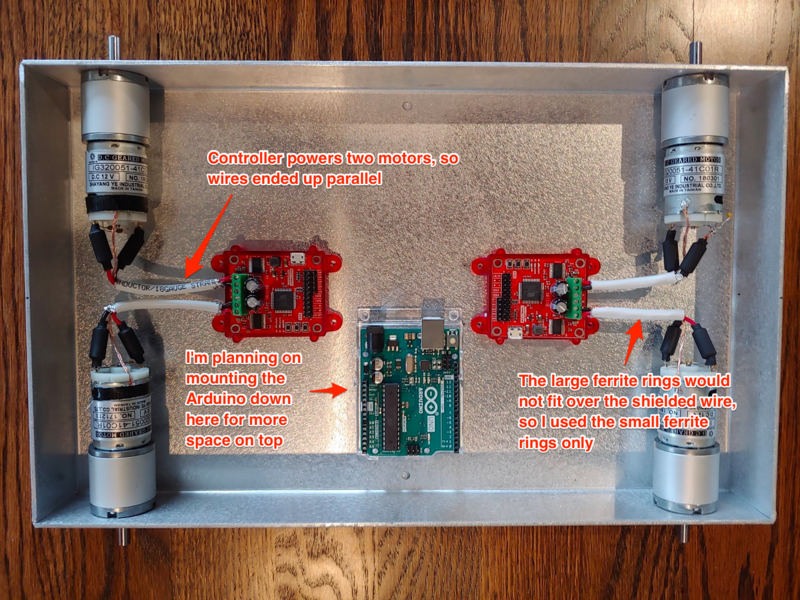 * Since each controller powers two motors, the wires ended up being close & parallel for a short distance. Will that cause any issues? * I’m planning on mounting the Arduino in the undercarriage, sound reasonable? I’ll run control wires up to a RasPi or TX2 on the top. * I tried and tried, but couldn’t get the large ferrite rings over the larger shielded wire. I am using the smaller ferrite rings on the wires right before attaching to the motor. Seem good? This topic was modified 3 weeks, 6 days ago by Andre. Great, thanks for the sanity-check!